I made this easy, Instant Pot Vegan Marinara Sauce last night, and even my wife (who hates spaghetti sauce) loved it. Forget that store-bought stuff, full of oil, preservatives, and who knows what else…. Homemade Marinara Sauce is AMAZING! I’ve also used it as a Bruschetta, a topping for Baked Potatoes, and it makes a killer homemade Pizza Sauce too. I see SO many requests in the FB Groups for store-bought, oil-free spaghetti sauces. I shake my head and say to myself…..make your own! It’s so EASY! And now, with an Instant Pot – can be ready in just under an hour. Perfect for those busy work nights when you really don’t feel like cooking. 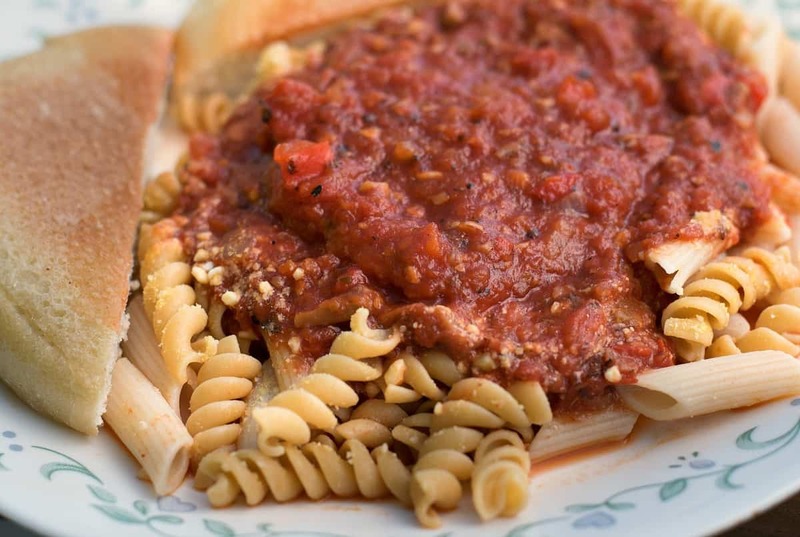 I first published the stove-top version of this recipe, Absolutely Divine Fat-Free Marinara Sauce way back in Feb of 2015 and it has consistently been one of my most favorited recipes. Serve with a side salad and maybe some warm, crusty bread – with a little smear of my Vegan Corn Butter (throw in some extra garlic) and YUM! It’s tastes so fancy and elegant, this could easily be a dinner to impress your non-vegan friends. And don’t forget, a Vegan Parmesan is easy to make too. Simply throw some raw cashews, nutritional yeast, salt, and garlic powder into a food processor and chop until it becomes a powder, and you have a deliciously cheesey topping – without using a single drop of dairy. Click on this link Vegan Parmesan for the recipe. Add 1/3 cup of chopped onion and 1/3 cup of chopped red bell pepper to your Instant Pot, and set it to LOW SAUTE. Add a few tablespoons of veggie broth or water so it doesn’t stick and simmer until softened, about 2-3 minutes. When the veggies soften, and in 2 LARGE cloves of minced garlic, about 1/3 cup of your favorite mushrooms (or a drained, 4oz can), and an entire 6oz can of tomato paste. Stir well as the tomato paste will want to stick. When the tomato mixture is mixed really well, turn OFF the heat, and deglaze the bottom of the pan with the red wine. You can substitute veg broth or water, but red wine gives it a very rich flavor. Add in the diced tomatoes, water, and spices, stir to combine and attach the lid. Make sure the lid is SEALED, and set your IP to MANUAL mode, High Pressure, and set the time for 8 minutes. When it’s done, CAREFULLY release the pressure (I use a Wooden Spoon) and give the sauce a good stir. Add salt and pepper to taste. If you have an immersion blender, you can blend the sauce to whatever consistency you like, or you could take a few cups out and blend in your blender to make it smoother too. I like my sauce kind of chunky, but it’s totally up to you. I hope you like this sauce as much as I do, and please feel free to leave those comments or tag me in Instagram with the hashtag #brandnewvegan. An Instant Pot version of an old favorite. 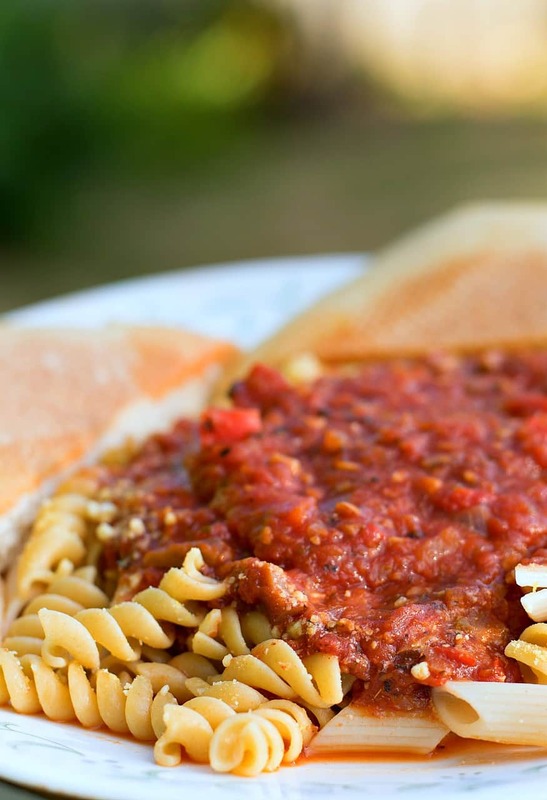 This Vegan Marinara Sauce is so elegant and delicious, your family will surely be impressed. Easy and fast! Saute onion and bell pepper on LOW SAUTE mode until softened. Use veg broth to keep from sticking. Add garlic, drained mushrooms, and tomato paste. Stir until mixed thoroughly. When sauce begins to stick to bottom, turn OFF heat and deglaze pan with red wine. Add water, tomatoes, and spices and mix well. When finished, use Quick Release method to carefully release steam. Stir in salt and pepper to taste. Use and Immersion Blender to blend to desired consistency. Or - remove 1-2 cups and blend in blender, then return to pot and mix well. Love My Recipes? Join my Private BNV Club! By subscribing to my Weekly Newsletter, I will send you "Five Easy Steps to Becoming a Brand New Vegan" including 5 of my very best recipes! Made this today. Love your site! Made this today! It came out great! I subbed agave for the brown sugar. Thanks for sharing the recipe! Are you using 14oz or 28oz cans of tomatoes? I have made this twice now and it is outstanding! It’s my new go to marinara sauce. Thank you! Delicious and very easy to make! What would be the ratio to use fresh tomatoes? I have a lot from my garden 😊. Also, does it freeze ok? Will this recipe double okay? And do you think the flavor will hold up if I leave out mushrooms? I love them, but my husband doesn’t. Tried this today – easy and super delicious! Husband loved it too! Hi I'm Chuck, and I make switching to a plant-based diet as easy as possible by recreating all of your favorite comfort foods. You're not going to believe how good it tastes and chances are, you're not gonna miss a thing!